Ray Romano Gets Deep, Dark And Angsty For Martin Scorsese's 'Vinyl' Ever since Everybody Loves Raymond, the actor says he has been trying to take on more dramatic roles. In the HBO drama Vinyl, he plays a record company executive who contemplates suicide. 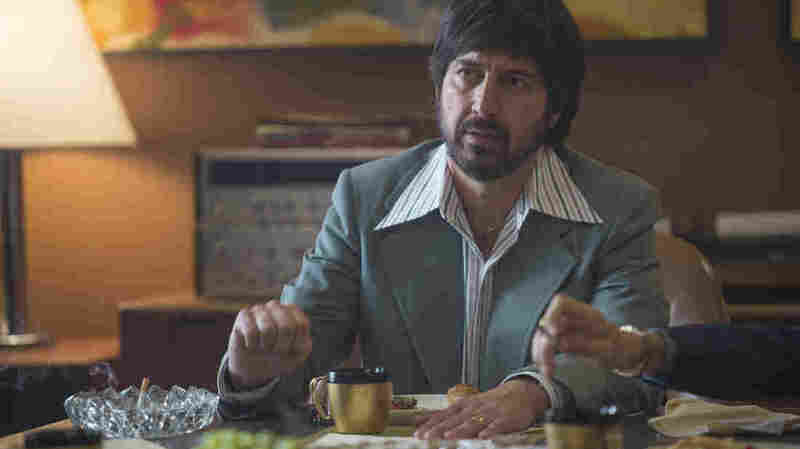 Ray Romano plays Zak Yankovich, a record company's head of promotions, in HBO's Vinyl. Ray Romano became famous in the mid 1990s as the star of the sitcom Everybody Loves Raymond, which was loosely based on his life as a married man with a daughter and twin boys. After that show ended in 2005, he co-created and co-starred in TNT's Men of a Certain Age, about three friends dealing with middle age, and had a recurring role on NBC's Parenthood. Now, in the HBO drama Vinyl, Romano plays the head of promotions at a record company in financial trouble. He tells Fresh Air's Terry Gross that ever since Everybody Loves Raymond ended, his goal has been to try something different. "And when I say different, I mean something a bit dramatic." Vinyl was co-created by Martin Scorsese, Mick Jagger, Terence Winter and Rich Cohen, and it's set in the 1970s. I had to look from the 1970s and I went to my wardrobe — it was actually very easy to find a shirt in there that fit in that era. ... I told my wife, who is constantly trying to throw those things out, I told her it would come in handy one day. I put that on; I did a couple scenes; we sent it. And the feedback we got from Ellen was, "Marty likes what he saw. ... He knows this person," meaning he knows the guy I was playing. "He knows this guy. But also, he's never heard of Ray Romano," and it turned out to be a blessing. It's much darker, there's more depth to it, there's more angst, of course. In the very second episode of Vinyl, my character kind of contemplates killing himself — not kind of, he does. The difference between Men of a Certain Age [and Vinyl] is I'm writing Men of a Certain Age, so I know what's coming and I know why it's coming. And here it's all having to process it and figure out and get myself to that place, so it's different but it's very exhilarating. By the way, I do in real life. I'm at an age where crying is easier for me now. I like it. I can cry at a poignant commercial; I can cry at a — this is a running joke in my house, but ... a good "Star-Spangled Banner" can make me cry. I'm not kidding. I look them up on YouTube and I find the most emotional ones. And I like a good cry — it's cathartic; it's a release. But I've never been able to be so free to do that on camera the way some actors can. My brother is a New York police officer, or was then at that time. He actually coined ... the title Everybody Loves Raymond. ... In real life, he would come over and he'd see I got an award or I got something for stand-up comedy and he would jokingly, kind of tongue-in-cheek, he'd say, "Well, look at Raymond! Raymond gets awards when he goes to work. When I go to work, people shoot at me, people spit at me. But when Raymond goes, everybody loves Raymond." So I told this story to [Everybody Loves Raymond Executive Producer Phil Rosenthal]. Phil said, "We have to use that ... as the title." And I said, "Please don't." He said, "Well, let's just use it as the working title, and then we'll change it when it comes time to go to pilot." And of course Les Moonves, the head of CBS, fell in love with the title and he would not — I tried desperately to change that title. ... It's just asking for trouble. ... Even if they don't take it at face value, to this day someone will start an article with, "Well, not everybody loves Raymond!" The show was ending and it was a bit of a cool feeling in the beginning because now, all of a sudden, you've got all this time, you've got this money and this fame now. But it was like coming out of a submarine — it was like, "What is this now? My kids are teenagers and I live here? I live in LA?" It was kind of an odd new feeling. At first I liked it. I kind of said, "Let's see what's next!" I was going to a therapist — I've been going to a therapist forever — but my therapist then said, when the show was ending, he says, "You want to start coming twice a week?" And I said, "No, I'm running out of things to talk about now. I'm not going to come twice a week." Sure enough, in three months after the show ended, I was going twice a week. It was really a hard adjustment all of a sudden because I'm not really doing stand-up now. Before the show, I was doing stand-up every night, writing new material. It was this void. It was this big, big void. And I realized I need to do stuff, I need to continue. ... I went through a little rough patch there. I finally talked with my buddy Mike Royce, who was also a writer on Raymond, and he said he's got the same feeling. It's kind of this weird, "Where am I? What am I doing now? Where's my next passion and purpose? I'm at a time in my life where I accomplished what I wanted to." We said, "Let's write about it. That's what Raymond was — Raymond was about writing what you know. Let's do that. We're not going to do a sitcom, of course; we want to do it real and keep it funny. But let's do a single-camera and write about it." And that's where Men of a Certain Age came out of. We won a Peabody Award and then they canceled us. I'm not Justin Bieber. I can outrun my fans, I'll put it that way. It doesn't really affect my life too much, really. Yes, it does in some sense. Here's what I say: Before I thought my cab driver hated me; now I think my limo driver hates me. I think it's all the same. ... I'm just as neurotic. If I had never gotten famous or rich, I think I'd be equally neurotic.